While older CRT TVs and monitors had glass screens that were fairly easy to clean, today's flat screen plasma TVs, OLED TVs and LED TVs are a little more complicated. They're more sensitive and prone to scratching, yet they gather just as much dust and fingerprints as their predecessors. To clean these screens thoroughly and safely, follow these tips. Turning off your screen will make it much easier to see dust and fingerprints. It will also prevent you from accidentally hitting buttons if you're cleaning a touch screen. Gently wipe away dust and fingerprints with a dry soft cloth. You may not remove everything this way, but you will probably take care of a good amount of dust. Never press harder on the screen than you have to since you can damage the pixels very easily. This isn't normally a problem with touch screens since they're made of sturdier glass and are designed to be touched, but you need to be careful regardless. If you don't get rid of all the dirty spots on your screen with a dry cloth, try wetting it with distilled water or a solution of water and white vinegar. You might even be able to find a small spray bottle specifically designed for LCD TV or plasma TV screens if you check out an electronics store near you. This solution should get rid of fingerprints and other dirty spots. 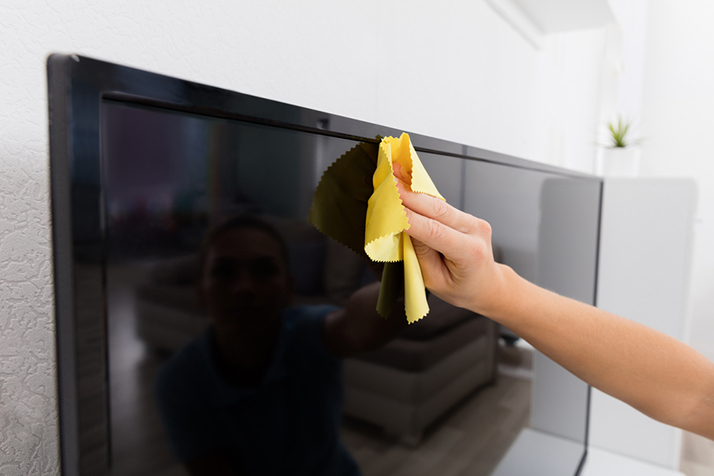 When cleaning a flat screen on a smart TV or any modern television set, remember to always use a soft, lint-free cloth. Never use paper towels, tissue paper, or any other non-ultrasoft material. These can scratch your screen and permanently damage it. Avoid any cleaning products that contain ammonia, and never spray liquid directly onto your screen. Apply a water and vinegar mixture to your cloth instead. Finally, apply these tips to any modern TV. These rules apply to plasma TVs, LED TVs, and smart TVs as well as flat screen monitors. The basic principles of cleaning the physical screen will always be the same, no matter how advanced your TV might be.